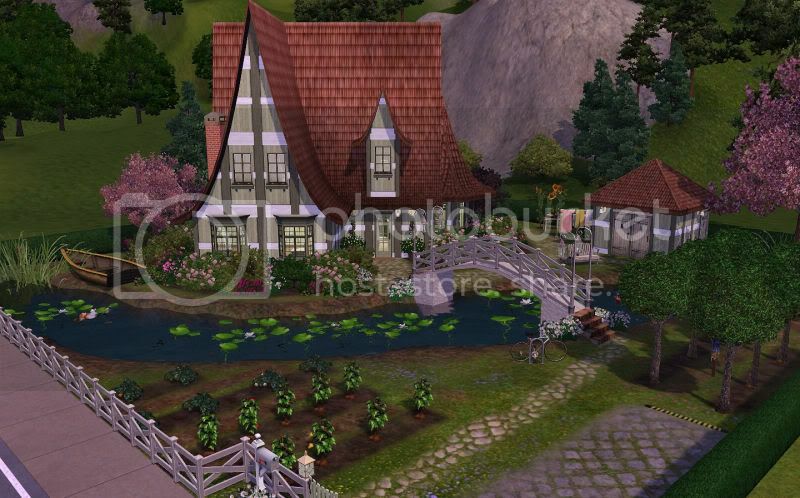 Greenwood Creek is a two-storey character house ideal, for instance, as a background lot for Sims story tellers or those Sims players who like to mix a bit of fantasy into their neighbourhoods. With 3 bedrooms, 4 bathrooms, lounge, study/library, combined kitchen and dining, laundry/harvest/nectar making storage shed, bbq and entertaining table, driveway for one car, bicycle with rack, mixed orchard, vegetable patch and fish in the creek. 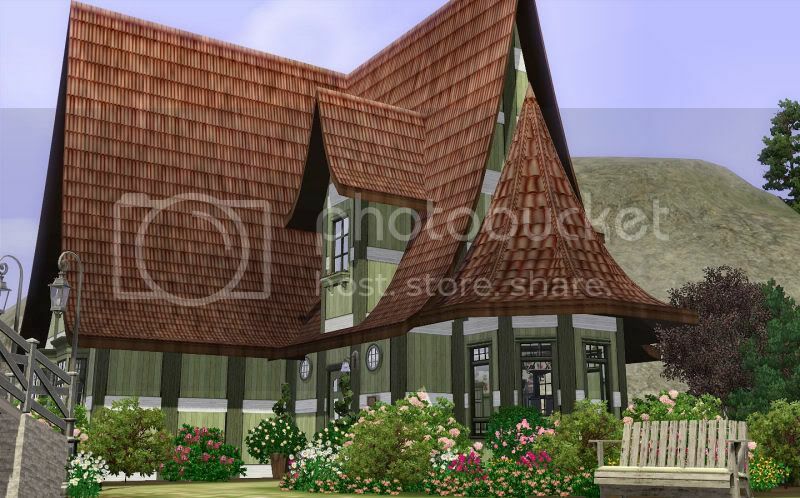 Unfortunately, the second floor of the house (roof level) was unusable as a living space due to the roof eaves protruding everywhere and although this did not stop the Sims from using furniture and objects (when I tested it), it looked awful. I decided to build into the basement instead. It was roomier, and with the right wall treatments, turned out quite light in there afterall. Just like my Puggle Farm lot, this one has been built entirely on an angle, therefore, if you want to move furniture around etc you may need to use both the "moveobjects on" and "disablesnappingtoslotsonalt on" cheats. I remember when I made my park, Garden of Eden, I had so much feedback on the bridge not working, so I thought why don't I make a fence around it, that'll force them to use it, and it did Dunno if there is any other way to make them use the bridges on their own. 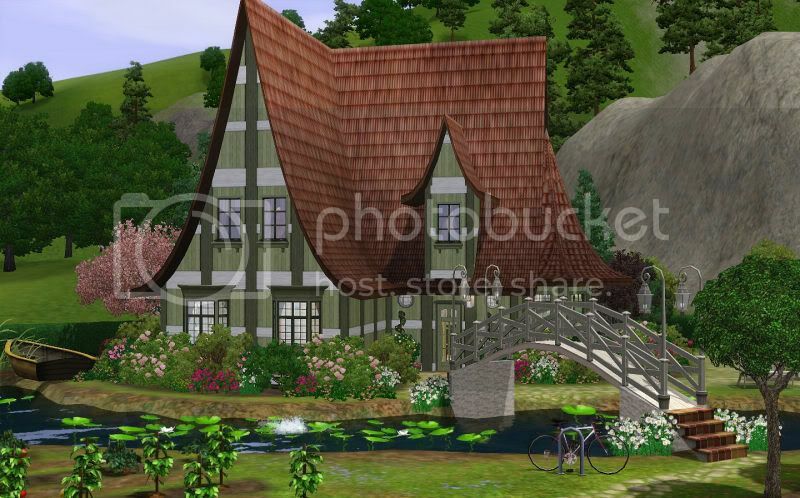 Fantastic, I love Storybook Style houses and this is gorgeous! This is just the cutest house ever! I totally had to have it! Thanks so much! This is gorgeous. Bugger the sims I'd love to live in a house like this! Thank you. I don't have WA, but I wish I did... this is beautiful... I LOVE IT!!! I have tried many times before! But it never worked. Thank you! It works amazing in the game too! hi jfacc - the stairs are not diagonal, everything around them is diagonal (if that makes sense). Just lovely, you have an amazing attention to detail. Thanks a lot, this is beautiful. Have a bright platinum diamond day! Yay, congrats on getting it featured. It's definitely beautiful.